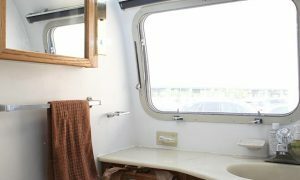 Classic Airstream 34 Feet Location Production Trailer, modified with 2 hair & make-up stations and a curtain divided wardrobe room for styling & dressing. Each make-up table also folds away when not needed. 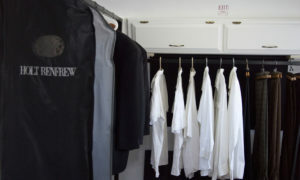 NOTE that wardrobe room can be converted back to a bedroom if a star suite is desired for actor/musician/celebrity. There is a large flexible storage space for stylist accessories with 4 folding shelves which when down also allow for large item storage or 3rd additional cloths rack. 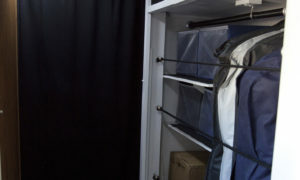 (Pictured here with 2 shelves up and other half with cloths on rack) The wardroom room itself features a William Prager custom L shaped clothing rack 13 feet in total length. 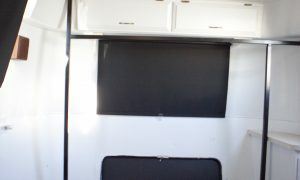 Front of trailer door access opens into a spacious lounge area for photographer/film-maker, client, models/actors & crew. 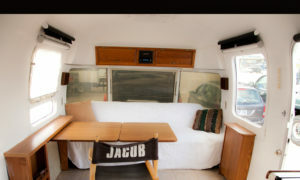 2 fold-away tables can be used for computers, catering etc etc. 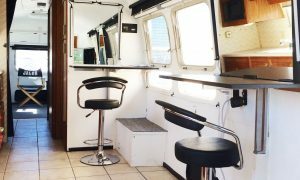 Two make-up stations are LED 6000K lit with large windows providing a bank of daylight if desired. All windows have defuse white & full black drop down blinds. 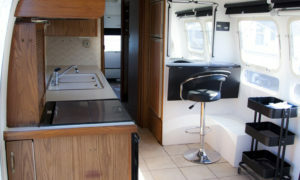 We kept the kitchen area ‘as is’ in this Airstream so the full sink/counter can be used for catering spread and the large fridge will hold all the cold drinks you will need on a gig. 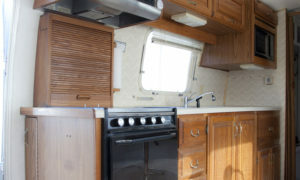 Airstream is powered by 2 slaved Honda 2K generators effectively delivering 4K at 30 AMP. 2 back-up Honda 2K generators are also available to handle any additional power needs at trailer or on set if more than 4K is needed for AC like on those pesky 30+ degree celsius days. Lots of heat provided by propane furnace allows us to work well into the cool northern fall. 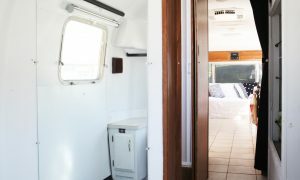 2 Solar Power Panels also constantly recharge the trailers 12Volt power system for interior lighting leaving all the 4K for electrical 110V appliances. 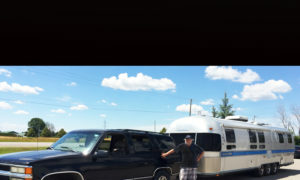 Rate for Montreal & Toronto Area is 1000.00 Day ONE 12 Hour Day ALL IN includes driver & genies. Overtime after 12 hours 50.00 per. ONLY gas for truck & genies on top as per receipts. Client must have liability insurance & bring own steamer. 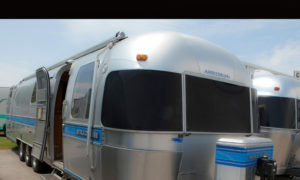 To use Airstream as prop 500.00 extra. Better rate for multiple days negotiable of course. 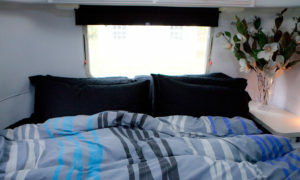 Also available to be delivered anywhere Eastern Canada & East coast USA, South-West USA, anywhere FUN with cost of additional gas & expenses on top. 50% Deposit upon booking confirms and secures your date(s). 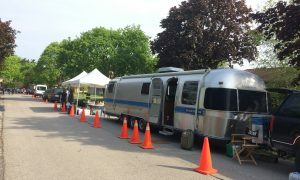 Upon request we can include 10 cones, 8 outdoor chairs, outdoor folding table and additional coolers for exterior/on set. I am also an experienced producer/production assistant/behind the scene photographer & location scout. I speak English, French & German. My CV is available upon request. 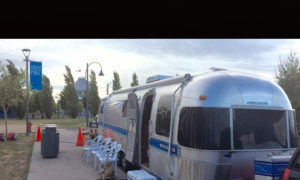 Special rate for bundle Airstream Production Trailer & Marky Marc as assistant to your Producer/Photographer/Team.